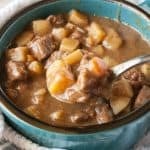 This slow cooker beef stew will warm you right up this fall and winter with it’s tender pieces of meat and veggies in rich brown gravy. 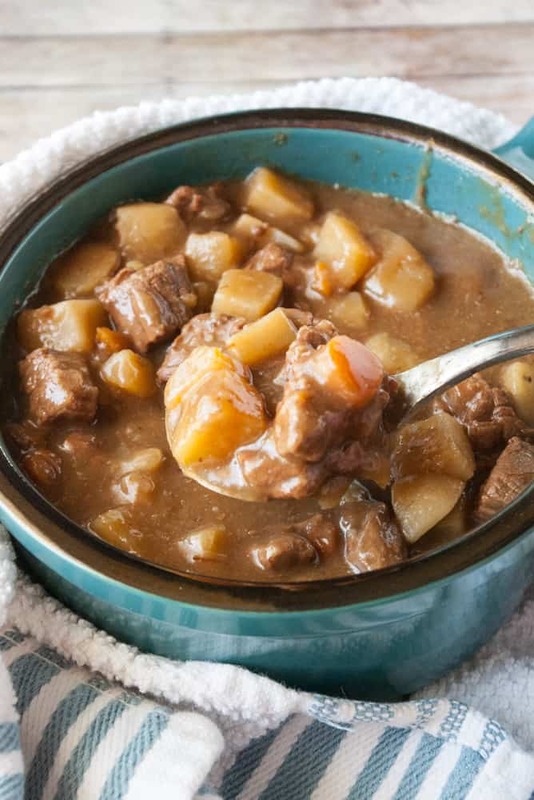 Add this slow cooker beef stew to your back to school menu! Those first couple weeks of school are crazy! How great would it be to make dinner earlier in the day, dump it in a crockpot and not think about it again until dinner time. Pretty awesome, right! This is a very basic, simple yet delicious beef stew that you’ll be making time and time again! Trust me! So I’m going to share with you the secret to restaurant quality soups and stews here. When making soups and stews you should always “sweat” the vegetables. Potatoes are the exception to the rule though. Don’t sweat the potatoes. Sweating vegetables is similar to sauteing but you use less butter or oil. Also, the vegetables will only be half cooked. The purpose of sweating the vegetables is to bring out their flavor and will make cooking time shorter in most cases. You can see above that I have the carrots, onion, and celery sweating in my pan. This process only takes a couple of minutes. I started by melting a little bit of butter in my pan over medium high heat. Once sizzling I added the vegetables. Within about 3 minutes the onions and celery start to look a little translucent. At this point I remove the pan from the heat and dump the veggies into my crock pot. Next, using the same pan, I brown the stew meat over medium high heat. Once the meat is browned, stir the flour into the meat. Add 3 cups of the beef broth a little at a time to the flour and meat stirring constantly so the flour all gets absorbed and is smooth. Once all 3 cups of the beef broth has been added, simmer for about 5 minutes then pour it into the crock pot with the vegetables. Add the potatoes and remaining beef broth. Stir it up and cook on high for 4-5 hours. 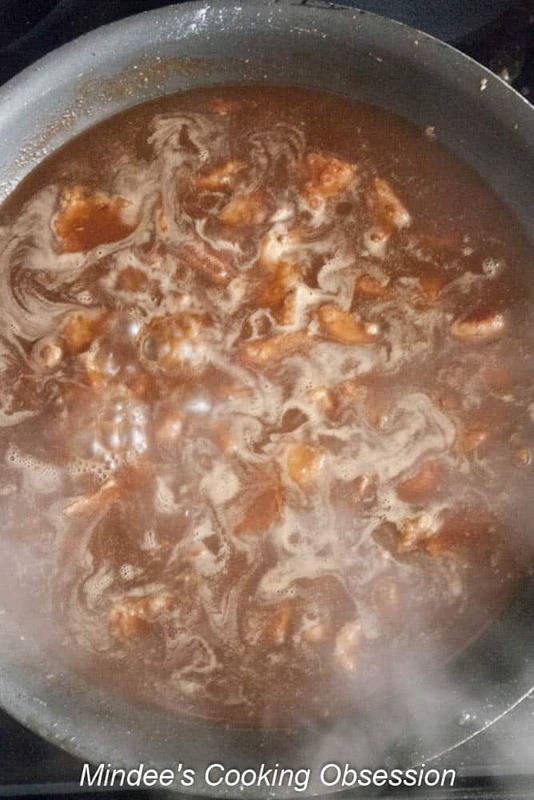 At first the gravy will seem like it is too thin, but don’t worry, it will thicken more as it cools. Melt butter in a frying pan until it starts to sizzle. 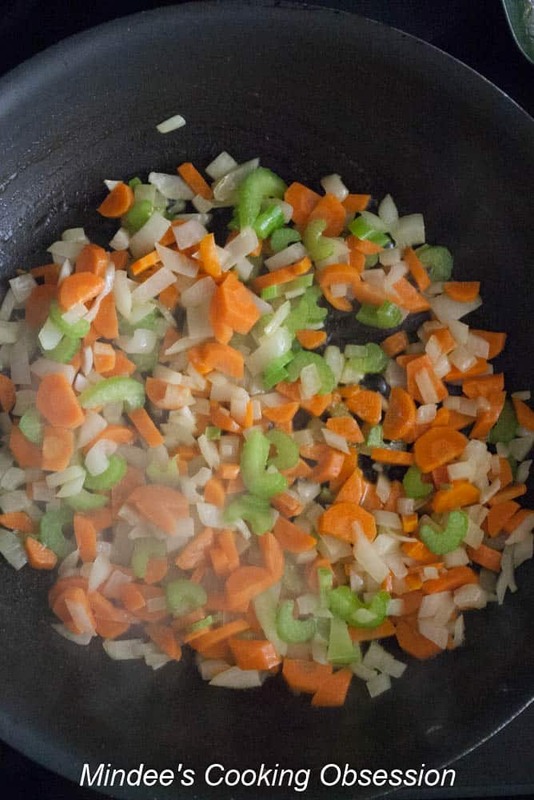 Add the onions, carrots, and celery to the pan. Sweat the vegetables for about 3 minutes. Onions and celery should be starting to turn translucent, but should not be cooked through. Remove vegetables from heat and dump them into a 2 quart slow cooker. Using the same pan, brown the stew meat over medium high heat. Once browned, stir the flour into the meat. Add 3 cups of the beef broth a little at a time until all the flour is absorbed and the gravy is smooth. Simmer for about 5 minutes. Remove from the heat and pour into the slow cooker. Stir the potatoes and remaining 2 cups of beef broth into the slow cooker. Cook on high for 4 to 5 hours. At first the gravy with seem like it is too thin, but don’t worry, the gravy will thicken more as it cools.